We miss you Stuart. We know you’re running with our Lilly”bug”. Time is a funny fickle thing. It can move so slow or race by in a second. Sweet Angel Stewart….we miss you. We’ll never forget you Stu! You are a true ANGEL now at the Rainbow Bridge waiting for your Pawrents, and playing with all of our little Angels that we have all also lost! You are all free from the pains of earhtly existense so we are happy for that! We know you are waiting for us and we will be there to be united with you, soon! 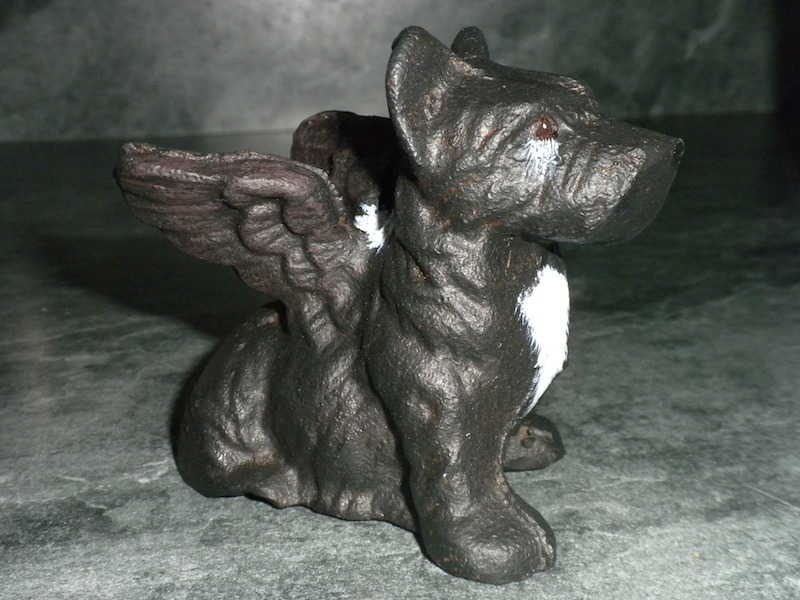 That is the most thoughtful and darling little cast iron Stu statue gift ever! 18 months for us. It still hurts. I’m having a “Kyla moment” right now. Oh Stu-art! How is it already 6 months?! Such good memories you shared with us! You are keeping him alive in our hearts. We all miss you Stu…………..
We will always have that handsome Scottie, Stuart, in our hearts!! Love and hugs to his Peeps. Time goes tooo quickly – maybe physically gone, but not forgotten, and loved by us all!! !